420 pages | 13 Color Illus. | 25 B/W Illus. Abiotic stresses are known to adversely impact agricultural productivity on millions of hectares globally, and it is projected that these problems are likely to increase, primarily due to anthropogenic interventions as well as climatic changes. Understanding abiotic stresses—especially salt stress on soil—calls for an interdisciplinary approach because salt-stressed soils need hydro-technical, chemical, and agronomic interventions as well as an understanding of plant response when exposed to these stresses. This volume explores and conveys the latest information on emerging technologies in the management of abiotic salt stress and their field applications. It brings together experts from various fields (academia, technology, and engineering) to provide the latest information and knowledge on this important challenge. "A welcome addition to the literature. It presents a holistic interdisciplinary approach to resolve these global problems of irrigated and dry land regions." "In the context of 800 million people remaining hungry currently, to feed 9.7 billion people in 2050 will be a real challenge. While some respite is foreseen through management of land and water resources, reclamation of degraded land and water resources provides an opportunity that needs to be unlocked. 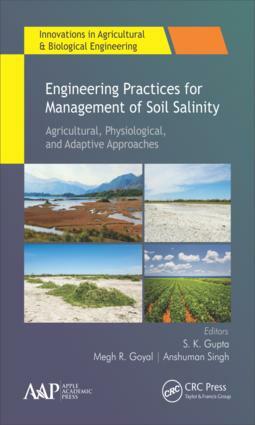 This volume presents some interdisciplinary keys to unlock the potential of salt affected saline/sodic soils for higher productivity." S. K. Gupta, PhD,is an INAE Distinguished Professor at the Central Soil Salinity Research Institute, Karnal, Haryana, India. He has served as Head of the Division of Drainage and Water Management, Head of the Division of Irrigation and Drainage Engineering, Head of the Indo-Dutch Network Project, and Project Coordinator of the All India Network Project on Use of Saline Water in Agriculture at CSSRI, Karnal, India. He was also a visiting scientist at the US Salinity Laboratory, California, and the International Institute for Land Reclamation and Improvement, the Netherlands. Dr. Gupta has published several books, 130 peer-reviewed papers, and over 100 technical, popular articles, book chapters, and bulletins. He is currently the Chief Editor of the Journal of Water Management. Megh R. Goyal, PhD, PE, is a Retired Professor in Agricultural and Biomedical Engineering from the General Engineering Department in the College of Engineering at University of Puerto Rico–Mayaguez Campus. He has worked as a Soil Conservation Inspector and as a Research Assistant at Haryana Agricultural University and Ohio State University. A prolific author and editor, he has written more than 200 journal articles and textbooks and has edited over 50 books. Anshuman Singh, PhD,is currently working as a scientist at the ICAR-Central Soil Salinity Research Institute, Karnal, Haryana, India. He has published research papers, book chapters, technical/popular articles, and epublications. He has made several presentations at professional conferences and has made significant editorial contributions to key R&D documents of the Central Soil Salinity Research Institute.